History Revisits in Peculiar Places. My small farm has the good-fortune of having a creek work its way through the property. It is located between my house and the garden. It probably is more accurately described as a drainage ditch, but I like to think of it as a creek. Drainage ditch sounds less than inviting, and not the least bit enticing to visit! The creek offers several benefits. I love listening to the sound of rushing water after a good rain, and I cherish watching the gentle meandering path the stream takes when water levels have receded. In the spring I utilize the creek to draw water when transplanting young plants into my adjoining garden. There is a swimming hole that entertains my son and his dog during the summer when it’s hot. I often find myself watching dragon and damsel flies flit about the vegetation under the canopy of trees during the warm months and I relish getting lost in the calm. Sometimes my husband and I find items of notice in the creek bed. I found an “almost intact” gallon pottery jug. I thought it was perfect until I looked at the bottom and found a wedge missing. I love that jug and now it sits next to the garden as a reminder of found treasures and as a tribute to whoever used it in their household once upon a time. When I was a child I played in a creek on the farm where I grew up. I loved finding broken bits of pottery and wondering who had handled the dishes that produced the fragments. When my husband or I find things now, I still find myself thinking about who the bits belonged to, where they lived, when they lived, and what shaped their lives. I have been interested in archeology since I was a young girl and finding things in the creek gravel continues to awaken a curiosity about who owned the artifact and how it got to my creek bed! We have found many items over the years in “our creek.” There has been a tremendous amount of junk and rubbish. But hidden treasures come to the surface once in a while. Found nearly perfect! Not much use for an electric insulator these days; maybe it could be a paper weight. Last week my husband found 3 glass mason jar lids. Two of them are milk glass and one is clear. All are in perfect condition. Antiques for sure. Valuable? Only to me, most likely. I know how they were used in the late 1800’s and early 1900’s, and I am only happy to enlist them into service in 2012. 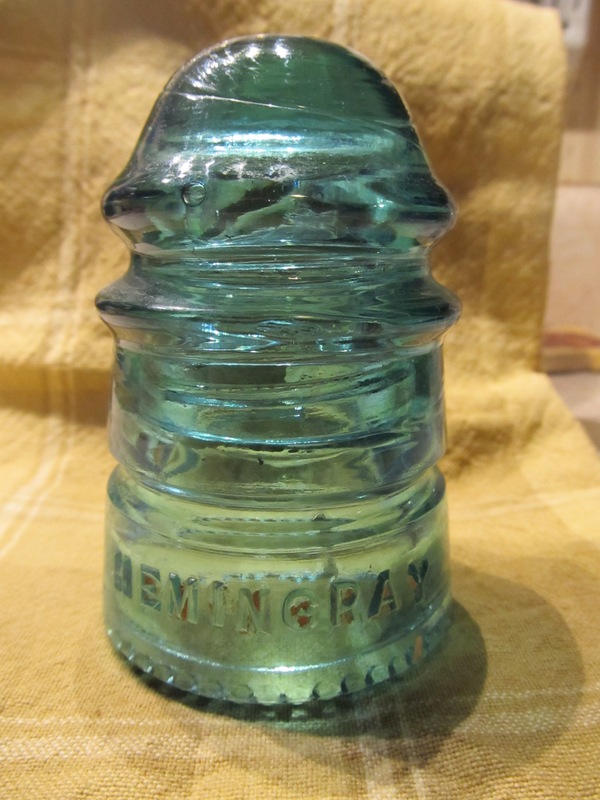 Glass lids were used to create a barrier between the contents of canning jars and zinc lids. Today I use the lids with a metal band to secure opened jars of home-canned goods in the refrigerator. The clear lid is from the 50’s I think. 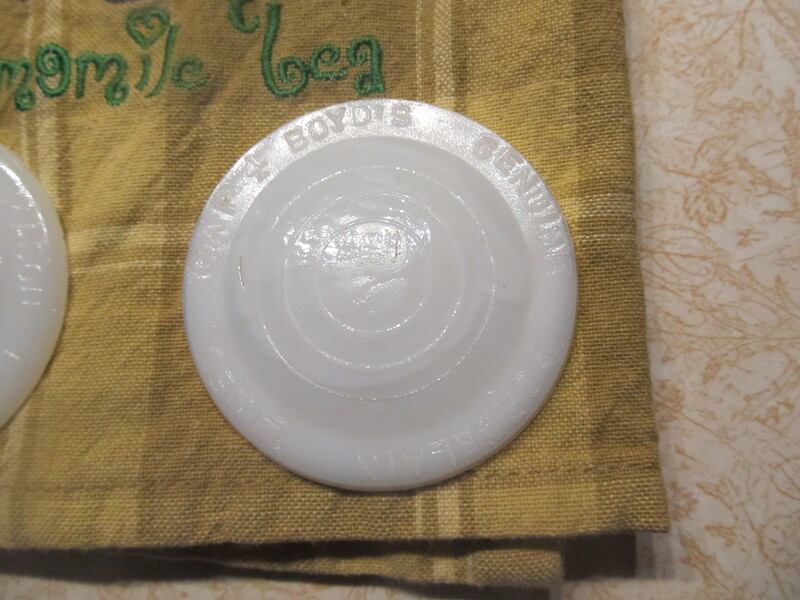 One of the milk-glass lids has concentric circles and the other is plain. The plain lid is the earlier of the two from what information I have found. If someone knows more about these items I would love to know! I have been lucky to find apothecary bottles. They are in near perfect condition. 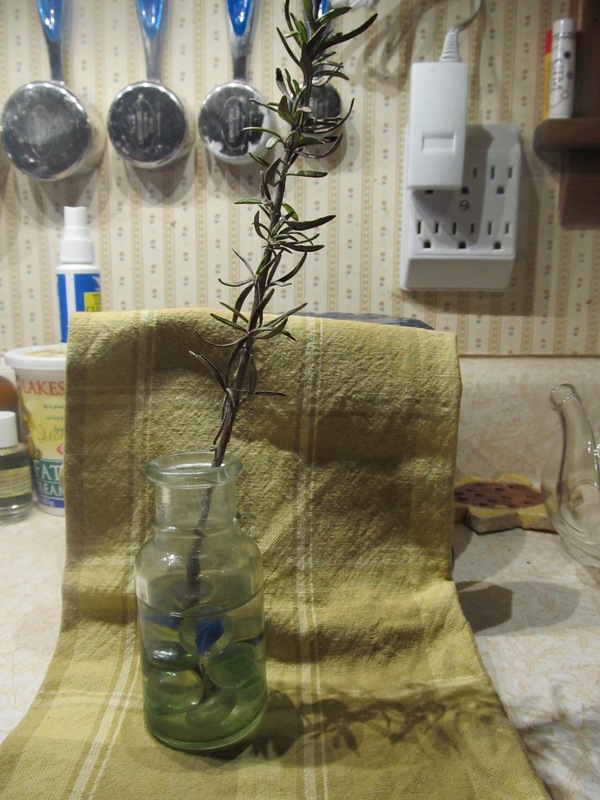 I use the bottles to hold herb stems (this is rosemary) or fresh flowers. They sit on my window sill over the kitchen sink where I can enjoy them every day! It’s fun to find things once used by someone else who shared something in common with me, and then be able to put the items into service again! I know that while reclaimed items can be repurposed in my life, they also provide satisfaction to my history-loving nature. When I use these items I feel a tie to those that came before me and this brings me a Life’s Simple Pleasure. 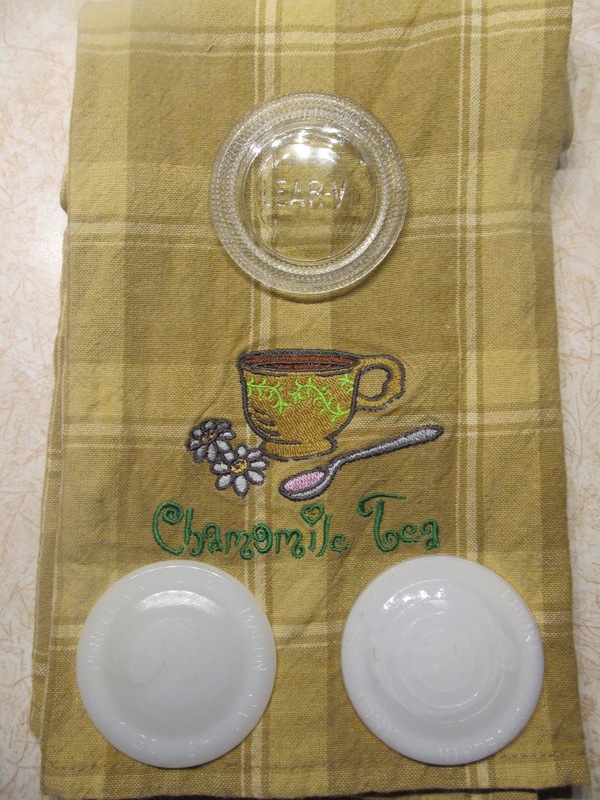 This entry was posted in activities, food preservation, Household, Life's Simple Pleasures, Uncategorized and tagged apothecary bottles, Boyd's mason jar lids, creeks, glass insulator, repurposed, Treasure hunt. Bookmark the permalink. 3 Responses to History Revisits in Peculiar Places. Your experiences of finding interesting items in the creek remind me of a time when my siblings and I, as kids, walked in the woods and found fossils. An exciting find, it filled me with wonder about the forces that created the fossils and the time needed to produce them. I agree that you can find great pleasure in the simple things. I once found a fossilized mushroom a few years ago. What a treasure that is for me….I am a fossil hunter too. Greetings from Ohio! I’m bored to tears at work so I decided to check out your blog on my iphone during lunch break. I really like the knowledge you present here and can’t wait to take a look when I get home. I’m surprised at how quick your blog loaded on my mobile .. I’m not even using WIFI, just 3G .. Anyhow, fantastic site!